A trade union leader has been recorded suggesting that Israel “created” the anti-Semitism row in the Labour Party. In a recording published by the Independent, PCS general secretary Mark Serwotka suggested the country had created the story to hide what he called its own “atrocities”. Labour Against Anti-Semitism said Mr Serwotka had brought the entire TUC into disrepute and he should resign. The PCS said he had made the point that anti-Semitism must be opposed. What is the anti-Semitism row doing to Labour? The Independent reported that Mr Serwokta had told an event organised by the Palestinian Solidarity Campaign at the TUC this week that there was no place for anti-Semitism in the Labour movement. “I think it’s unfortunate that the Labour Party allowed a lot of this to drag on, in a way that actually didn’t help anybody,” he said. “Now I’m not a conspiracy theorist, but I’ll tell you what – one of the best forms of trying to hide from the atrocities that you are committing is to go on the offensive and to actually create a story that does not exist for people on this platform, the trade union movement or, I have to say, for the leader of the Labour Party,” he said. 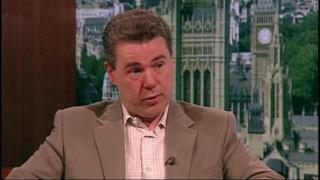 Mr Serwotka rejoined the Labour Party in 2016 after 25 years. On Wednesday it was announced that had been elected TUC president for the coming year. Labour has been dealing with a row about the extent of anti-Semitism within the party for more than two years. A 2016 inquiry, carried out by Shami Chakrabarti, concluded that while the Labour Party was not overrun by anti-Semitism, there was an “occasionally toxic atmosphere”. Earlier this month the party’s ruling body agreed to adopt in full an international definition of anti-Semitism. Mr Corbyn has apologised for hurt caused by anti-Semitism in the party and pledged to stamp it out. However some MPs have been critical of the leadership over what they say is its failure to get to grips with the problem. A spokesperson for the Public and Commercial Services Union said: “Mark spoke at a Palestine Solidarity Campaign fringe event at the TUC – an organisation PCS is affiliated to. “He made the point at the start of the meeting, that we need to oppose anti-Semitism in society and within the Labour movement.